Bio-Media Pro is a pre planting soil and media treatment which contains a high count of well-known beneficial, free ranging soil microbes, that mineralise many of the vital elements our plants need to grow into healthy productive crops and blooms. Typically shop bought potting composts and tilled garden soils can lack the essential life that is crucial to healthy plant life. Bio-Media Pro can give you the edge you need to quickly establish the foundation ratios of friendly bacteria and fungus that provide a natural symbiotic system for your organic crops and blooms. Why should I use Bio-Media Pro? Plants have existed in the wild with the help of soil microbes for billions of years here on planet earth. By adding Bio-Media Pro to your plant media you will help them maintain the distinct evolutionary advantages this partnership offers. With Bio-Media Pro , a grower can introduce vital plant-microbial relationships which occur naturally in soils. Typically shop bought potting composts and tilled garden soils can lack the essential life that is crucial to healthy plant life. Bio-Media Pro can give you the edge you need to quickly establish the foundation ratios of friendly bacteria and fungus that provide a natural symbiotic system for your organic crops and blooms. When should I use Bio-Media Pro? Use Bio-Media Pro before you plant up into your potting soils or coco media. 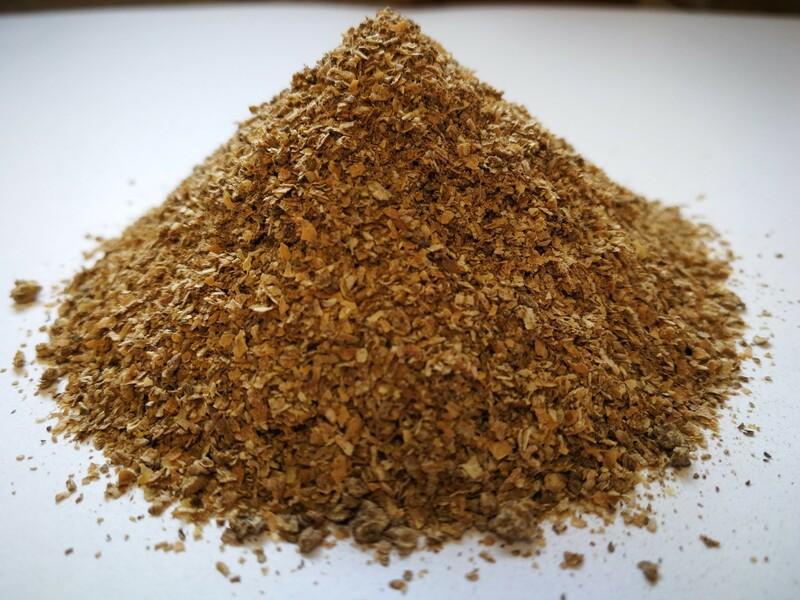 Adding Bio-Media Pro to your media allows the microbes to get a head start on converting organic matter and elements into useable plant ions, preparing more ideal conditions for your crops. How do I use Bio-Media Pro? 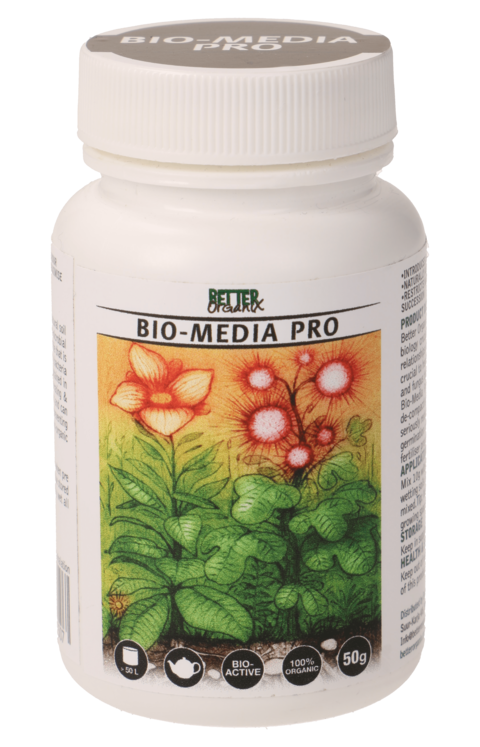 Bio-Media Pro should be added at 10g/100L of soil or dechlorinated water at a rate of 1g to 1L or (5g to 5L which is 1 tsp to 10.5 pints U.S.) This can then be drenched through your media before you plant up. We add only enough solution to adequately wet the media, we try to limit any solution run off, so maintaining maximum effect with less wasted microbes overall. Coco growers will need to make a note of this when using Bio-Media Pro. We do not run Bio-Media Pro to waste and this may be counter to how you water such media for buffering, as an example. In Coco we suggest bi-weekly top ups of Bio-Media Pro to maintain sufficient biology across the grow, whilst allowing users to maintain existing practice of run off applications of other nutrients and additives. It can be use in combination with all Better Organix products and any other organic or non-organic fertiliser programmes. It also complements the use of foliar tonics, soil tonics, compost teas and mycorrhizal inoculants. What media types are suitable for Bio-Media Pro? 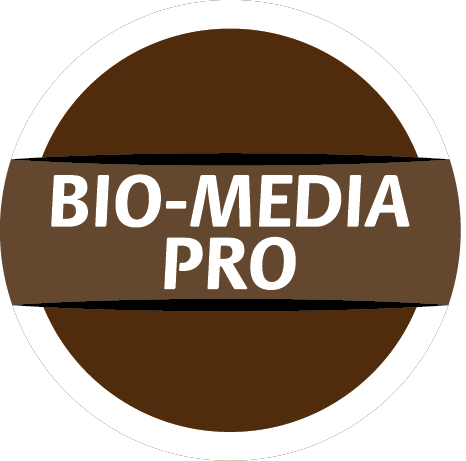 Bio-Media Pro can be used in most media types excluding those requiring an acid environment below pH 6.2. Suitable for indoor and outdoor use. What is the pH range of Bio-Media Pro? Bio-Media Pro can be used safely at pH ranges from 6.2 to 7.5. It can be used on all media types within this range. Solutions lower than pH 6.2 will result in many of the microbes becoming ineffective. It is not harmful, rather just wasteful in our opinion.